iTunes music videos files come encrypted with DRM (digital rights management) protection, which keeps legally purchased music videos from being played on your MP3 player, PMP, and other compatible hardware devices. So if you want to play your DRM'ed music videos on a non-Apple devices, you may need to unprotect the purchased iTunes files. Now AVS4Mac M4V Converter Plus features a solution for this. It is a professional DRM removal program with deciphering technology to transfer purchased or rented iTunes music video files to unprotected songs. With AVS4Mac M4V Converter Plus, you are able to remove DRM from your music videos with iTunes in only a few steps, and the quality of converted files is very high. As a result, you can play the unprotected iTunes music video files on many non-apple devices like Galaxy Tab/Note/S Series, HTC, Sony Xperia, and Windows 8 devices like Nokia Lumia, Surface. Here we will guide you how to remove the DRM protection from iTunes music videos and convert iTunes files to MP3, AAC, WAV audio formats with AVS4Mac M4V Converter Plus. 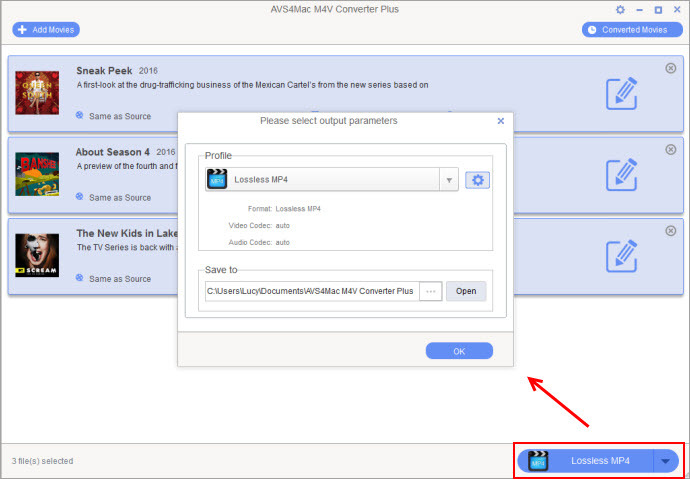 Click "Add" button on the upper left of AVS4Mac to import purchased and rental files from iTunes Library to convert. Then click "OK" to apply. Check the loaded video files and then go to the right to choose output format for converting. "Custom settings>Customized MP3/AAC/WAV" is recommended because you can get the original audio quality. Besides, you can also customize parameters like codec, bitrate, size, etc. Before click "Convert" button, you can set the output path you want to save the resulting audio format. Otherwise, it will be set by default. After you click "Convert" button, do not operate on iTunes in case that some error may happen. To sum up, AVS4Mac M4V Converter Plus can help you remove DRM from the iTunes music videos filesss and keep the rental videos or music forever. 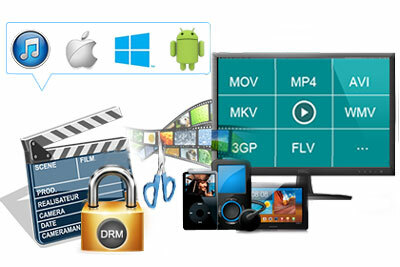 Now that this program can fulfill you needs, it is the best choice for you to strip DRM from your iTunes music videos. Step1: Adjust your iTunes settings. You will need to set iTunes to import into the .mp3 format. Click the iTunes/Edit menu, then select Preferences. Click the General button, and then the Import Settings button. From the Import Using dropdown menu, select MP3 and click OK.
Step2: Select the song you want to convert. Right-click and hover over Advanced. In the new menu, click "Create MP3 version." This will create a new copy of the song in MP3 format. Both the MP3 and the M4A files will appear in your library. Step1: Find your old protected tracks. In iTunes, click the View menu and select View Options. Make sure the box next to "Kind" is checked. This will display the Kind column in your iTunes library. Any song purchased before the removal of DRM will be listed as "Protected" in the Kind column. Step2: Upgrade the songs. Right-click on the songs that you want to upgrade and select Upgrade from the menu. Apple charges a $0.30 fee for each song that you wish to upgrade. Some songs may no longer be available for purchase, and therefore cannot be upgraded. TunePat Spotify Converter is a well-designed Spotify music downloader which is able to convert Spotify songs, albums and playlists to MP3, AAC, WAV or FLAC format at 10X faster speed with lossless output audio quality.